I have to make a doctor's appointment for a check-up. I hate talking on the phone. I would rather sit at home and talk to no one and not go outside ever. The worst part of going to the doctor's, besides trying desperately to not get lost on the way there (I am a terrible navigator), besides waiting for seven thousand hours in the lobby, besides not knowing all the information to write down on that impatient, menacing clipboard, is that my doctor likes to try to give me morals. I'm not a bad person or anything.. I just feel like I am going to be judged every time I go to the doctor's. Doctors should be morally neutral towards their patients! I am JUST saying. Just strict biology and science things. I don't need another reason to avoid going to get a check-up. It is bad for my health. It's sort of like how you avoid going to the dentist because you know that he has psychic dental powers and knows that you haven't been flossing 13 times a day, no matter how convincing of a liar you might think you are. They have to give you the same little lecture over and over about how dental hygiene is the pinnacle of life's list of things that are important, and you feel like you have severely disappointed them. Again. WHEN WILL YOU LEARN? NEVER? ARE YOU A FOOL? DO YOU NEED TO BE SENT TO A REMEDIAL DENTIST? And then you're worried that he's going to tell everyone about how stupid you are. 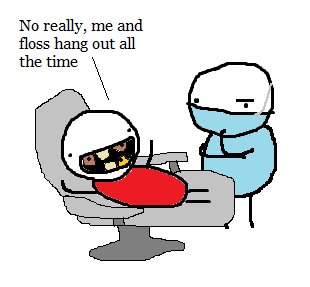 Dave's dentist seems like a total badass.